Today, 11th June 2018, marks the last day of Marbella’s week long celebrations of the Feria de San Bernabé. And while visitors will have enjoyed mingling with the locals as they party with gusto at the day and night-time celebrations, in a cacophonous clash of the traditional and modern, that sees elegant women in flamenco costumes jostling with tourists in their shorts and t-shirts, dancing to Sevillanas and bopping along to modern hits; few will be aware of its historical significance. For it was 533 years ago today, on the 11th June 1485, that the keys to the fortified Moorish city of the then named Marbil-la, was handed over peacefully to the Spanish Catholic King Ferdinand, coinciding with the Catholic feast day of Saint Barnabas; Marbella’s patron saint ever-since. With only ghostly traces remaining of Marbella’s Moorish past; reflected in the lay-out of the narrow-streets of the Old Town around which the newly reconquered Marbella developed and grew, along with the remains of the east-face of the fortress wall; it was wonderful to witness the historical re-enactment of the arrival of the Catholic King Ferdinand to reclaim Marbella, that took place yesterday morning. I made my way to the Church square where costumed actors, some on horseback, gathered for the start of the event and I experienced the first of many “flash-back in time” moments, on looking up and spotting a robed guard patrolling on a parapet. 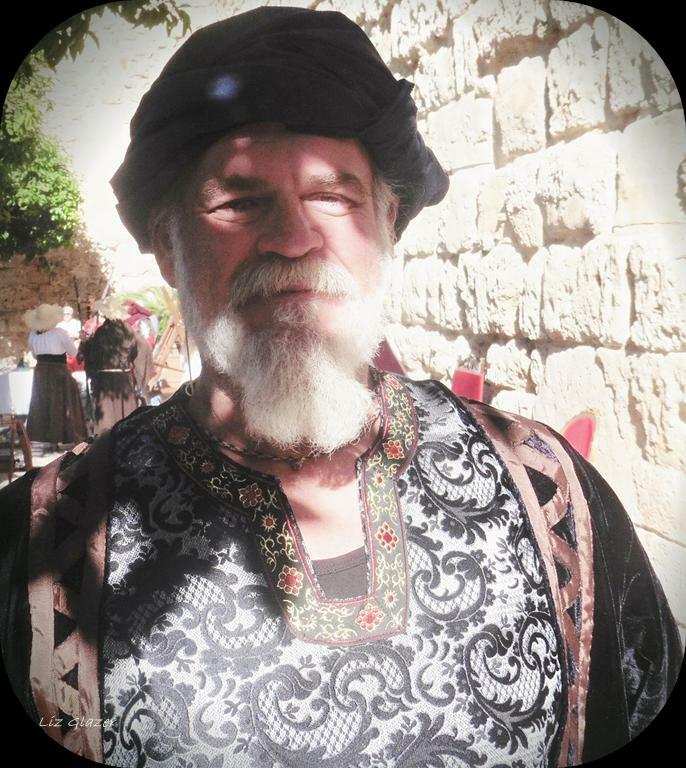 I literally bumped into a very imposing bearded man in an ornate Arab costume. “Alcaide Mohammed Albuneza,”he boomed in character. “And I’m just about to meet King Ferdinand and hand over the keys to the city,” he added, with a note of regret in his voice. Before the procession began, we were given a background explanation of the events to be re-enacted by the president of Marbella’s Fernando el Católico Cultural Association, who told us that the reconquering of Marbella was of vital importance in the subsequent fall of Malaga, due to its strategic position and sheltered harbour, essential for providing supplies for the Spanish Catholic troops to keep going. Apparently, King Ferdinand had just taken the city of Ronda and exchanged a series of letters with the Moorish governor, Mohammed Albuneza to persuade him to hand over Marbella, who in turn, did his best to hold the King off, while he waited for back-up defence. 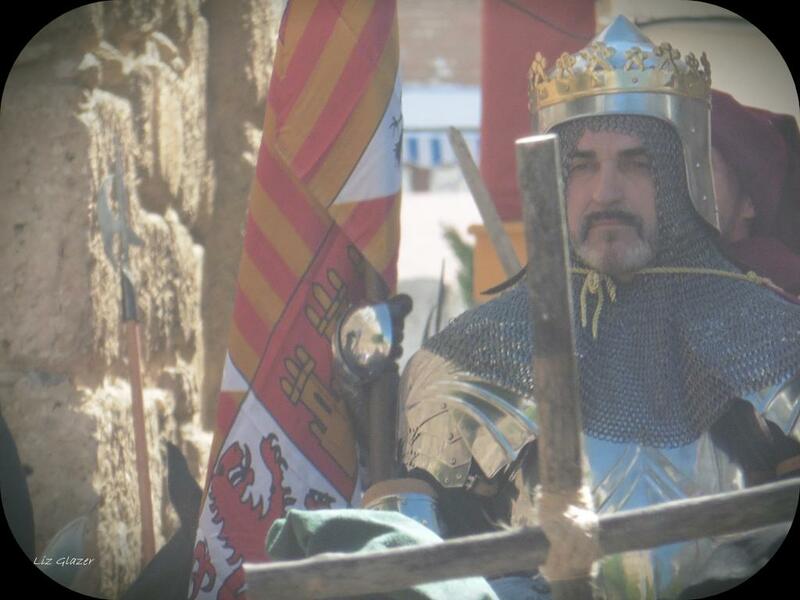 Seeing that Ferdinand’s troops were advancing upon Marbella regardless, after entering into negotiations for the safety of his people, he eventually capitulated, which culminated in the peaceful hand-over on the 11th June 1485. And so, “King Ferdinand” mounted his horse and followed by a retinue of guards and musicians, made his triumphant entrance through the streets of the Old Town – ending at Orange Square, where to the cries of “Viva El Rey Fernando!” from an appreciative audience, he waved regally from the balcony of the Town Hall, much to the bemusement of the tourists sipping sangria at the restaurant tables that are dotted around the square. The whole experience was like momentarily living in a bifocal time warp, medieval snapshots photo-bombed by shop and traffic signs and summer-clad observers and passers-by – but bravo to the organisers and all the performers who put on a great show, to remind us all of the significance and origins of Marbella’s San Bernabé Feria celebrations. Categories: Local culture & Traditions, Marbella History | Tags: historical reenactment, Marbella culture & traditions, Marbella Feria de San Bernabe, Marbella History | Permalink.